Gives students who work with CC an unparalleled experience, with hands-on opportunities for research and demonstration projects, fellowships, funded projects, and portfolio work. Crosses disciplines, from architecture to engineering, art, design, information technologies, transmedia, public policy and urban planning, health and recreation studies, sustainability – and more. Working in interdisciplinary teams on community projects enhances the academic experience. Helps students with job placement because of their real-world experience and portfolio work produced in conjunction with their CC experience. Helps create attachment and connections to Syracuse, fostering more engaged young alumni who are more likely to stay engaged a community leaders. The Connective Corridor has been a living lab and learning tool, as students do research, design and demonstration projects that build real-world professional experiences they can take with them to communities they will call home – whether in the region or around the world. The concepts that came from the initial international design competition that launched the Corridor were shaped through the School of Architecture, and faculty and students have been actively engaged through the entire project. VPA faculty and students designed the Connective Corridor bus wraps and interiors, and collaborated with an iSchool graduate student on the development of the USE mobile app. Designed for students, by students, it helped increase bus ridership counts to about 200,000 annually. One of the Corridor’s moved beloved projects, the Singing Sidewalk at Syracuse Stage, was created through a company launched by Physics Professor Ed Lipson. It will be celebrating a million steps as we ring in New Year 2016. Talented VPA transmedia faculty and students, working with Light Work and the Urban Video Project, brought outdoor IMAX-size projections to life at Everson Plaza – the first and largest project of its kind in the country to showcase international video artists in such a unique outdoor setting. 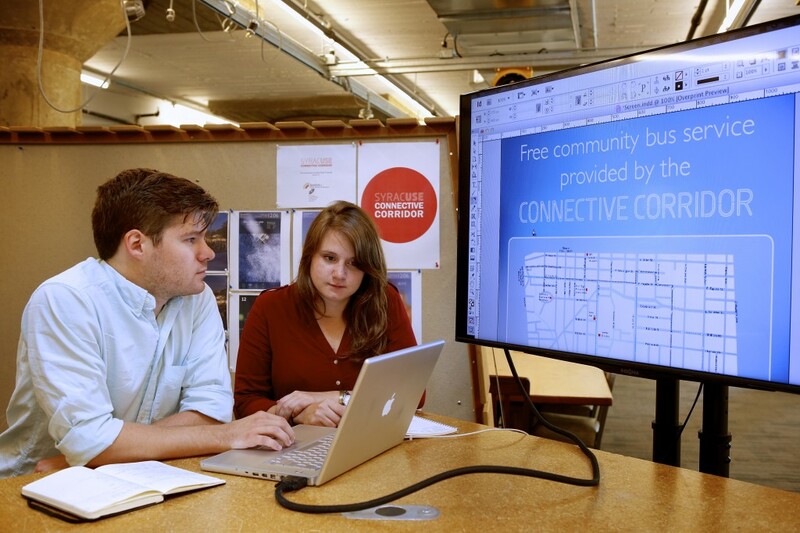 School of Architecture and School of Design students formed project teams to develop the Connective Corridor bus signage and interactive wayfinding systems. School of Architecture and School of Design students worked with property owners along the Corridor on façade improvement and historic preservation projects. A Maxwell graduate student surveyed property owners involved in the program to measure impact and leveraged investment, and developed a comprehensive outcomes report. Whitman and Newhouse students worked on Corridor branding projects. Geography students worked on mapping and property use analysis. Maxwell students worked on collaborative, participatory governance projects and helped develop cultural district strategy and public transit analysis. Architecture students designed the Erie Canal QR code mural on the Lemp building. Industrial and Interaction Design students worked on interactive billboard projects that integrated social media campaigns. Communications and Rhetorical Studies students developed programming for the Corridor buses that included “Poetry in Motion,” and readings, along with interpretive dance and music. Drama students sang on the buses. Falk College of Sport and Human Dynamics students helped activate the Corridor through “Green Streets and Local Eats” events that featured walking, running and cycling, as well as local foods. Students with Recreation Services helped create a downtown “Urban Adventures” project to introduce students to the City’s history and local highlights. They also joined with students across disciplines to help produce fun events as a “Zip-Fest” food truck rodeo that launched phase two construction. VPA’s School of Art and School of Design students worked with the Corridor and international artists on one of the largest public art calls in the country. VPA faculty launched a graduate course, “Connective Corridor: Public Art” to help students learn the process of commissioning and curating public art in public spaces. Graduate students in the Goldring Arts Journalism program worked with the Corridor on the development of content for interactive information kiosks to be installed along the Civic Strip. VPA’s Setnor School of Music faculty and students created “Time and Place,” a Connective Corridor project funded by a New York State Council on the Arts gran. A series that featured national and regional artists performing with Symphoria and university ensembles, as well as Syracuse University and community choral group, the series presented five world-premiere compositions in five iconic locations along the Connective Corridor. Graduate students from the Janklow Arts Leadership Program created social media strategies to reach new audiences, did data collection to produce an outcomes report. Student startup projects such as Centscere and Campus Neighbor brought social entrepreneurship to the Connective Corridor — doing good while connecting campus and community. Students from across disciplines have been involved in creative placemaking and community beautification projects across the Corridor. Students have assisted in cleanup projects, landscaping and planting, and pop-up art programming — all designed to help with aesthetics and streetscape activation. Students helped organize a massive student photography competition, “Cusescapes” that catalyzed students to experience downtown through a new lens. Students also producedor participated in numerous Corridor video projects. Students were part of planning and implementing CRAVE — downtown Syracuse’s first cultural rave, which produced 36 events in 36 hours across the Corridor. They also helped inaugurate projects such as Syracuse’s first Fringe Festival on the Corridor. A Connective Corridor Student Advisory Council created student-centered events to help encourage students to connect with downtown. Two recent examples included an “Experience’Cuse” Food Crawl and an “OrangeFit” health and fitness day on the Corridor. The Corridor has been the subject of numerous student research projects across the disciplines, from transportation planning to the formation of cultural districts, to engagement strategies for public design, innovative, interactive and collaborative design, and more. Students have conducted or been engaged in numerous focus groups for the design of major downtown urban real estate development projects. The Corridor office has been home to Imagining America Scholars and Fellows, undergraduate and graduate student interns, work study students, and student volunteers seeking meaningful projects that involve civic engagement strategies. The Corridor itself has been a field classroom. A construction management and controls course, based on the Connective Corridor, was offered as part of Syracuse University’s Civil Engineering program. It was taught by C&S engineers who worked on the Connective Corridor, and students in the course has opportunities for internships and field experiences. The streetscape reconstruction project engaged SU engineering students with recent Syracuse University alumni who were part of the project leadership team. B&L, the firm that led design, engineering and construction management for the Corridor, employs 20 Syracuse University graduates and 13 SUNY ESF graduates. The Connective Corridor Project Engineer in Charge – the person who oversaw one of the most complex construction projects this city has seen was Greg Miller, P.E., Class of 2007. Syracuse University prides itself on being part of a connected, supportive community that offers students the opportunity for professional engagement. It deepens the student experience, and it makes for an unparalleled Syracuse experience. American cities are experiencing an urban renaissance as young college graduates are looking to become part of dynamic, creative, entrepreneurial places where they can launch their professional and personal lives. Projects like this are helping make Syracuse one of those places – a city that is attractive for this next generation that is interested in great public spaces, walkability, diverse people and activities. The Connective Corridor is an urban incubator where students can work creatively with community leaders to help shape cities of the future. With half the world’s population under 30 years old, that’s a big exciting future to grab hold of. We’re pleased to be working with our federal, state, county and local partners to help shape it – and share it – starting right here in Syracuse.